I’m sorry to have to tell you this, but you are actually nothing more than a domesticated animal that provides nutritional life-force to vampires. Civilization, culture, human values and desires- these are all nothing more than the side-effects of vampiric domestication. We are all living in an invisible cattle pen and it’s the vampires and their small cadre of human minions who run the show. At least, that’s what Empire V argues. In this the second of his recent post-modern satirical novels translated into English (by Anthony Phillips), Pelevin introduces us to our actual overlords, the vampires, who, contrary to popular belief, have evolved above just drinking human blood to “sucking” humanity’s life-force instead. How is this life-force generated? By the everlasting human quest for money. As one of the novel’s most powerful vampires explains to the narrator (a human-turned-vampire), it is this quest that has driven humans to create and accomplish an astonishing number of things. The novel begins with Roman, a dissatisfied young Russian man wandering half-accidentally into a sketchy apartment and waking up to an interrogation. The end result? He’s turned into a vampire. You’re assuming that he was bitten, yes? Well…it’s complicated. Suffice it to say, Roman is given the “Tongue,” an entity that is mystically connected to the Mighty Bat (i.e. the vampire head-honcho). This “Tongue” rearranges his perceptions, allowing Roman (now renamed “Rama”) to tap into the vampiric existence and do things like sip human blood from time to time in order to understand human motivations and desires; or hang upside down like a bat for some vampiric meditation. 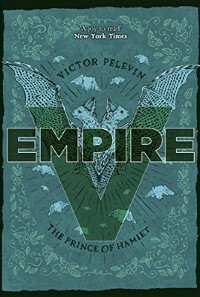 Empire V is, for the most part, a textbook for newly-minted vampires, rather than a conventional novel with a plot and well-rounded characters. While the narrator is one of these new vampires, we actually learn very little about him, and even less about his teachers (who school him in such areas as “Glamor” and “Discourse”). Rather, the book is a primer, a set of questions and answers to explain just how vampires came to be, how they’ve evolved, and their current place as humanity’s overlords. Along the way, we learn interesting facts like: vampires once even fed on dinosaurs, and vampires have an impeccable sense of style (oh wait we already knew that). And then we come across such insights as “the human mind is either a microscope through which a man examines the floor of his room, or a telescope through which he looks at the stars in the sky outside his window. But the one thing he never sees is himself in the right perspective” (211). And why “Empire V”? Well, we’re currently living in the Fifth Empire, “the humane epoch of Vampire Rule,” as opposed to the Third Reich and the “Fourth Rome of Globalisation” (256). Trust me, Empire V is unlike anything else you’ll read this year. Pelevin creates this complex vampire mythology in order to skewer modern-day corruption, cruelty, greed, and authoritarianism. We’re invited to become figurative vampires ourselves while we read, seeing our world with new eyes and analyzing all that we usually take for granted. So while this book might not follow the usual storytelling conventions that we’ve come to expect in the 21st century, it challenges us to see our world anew and question what might otherwise seem obvious.